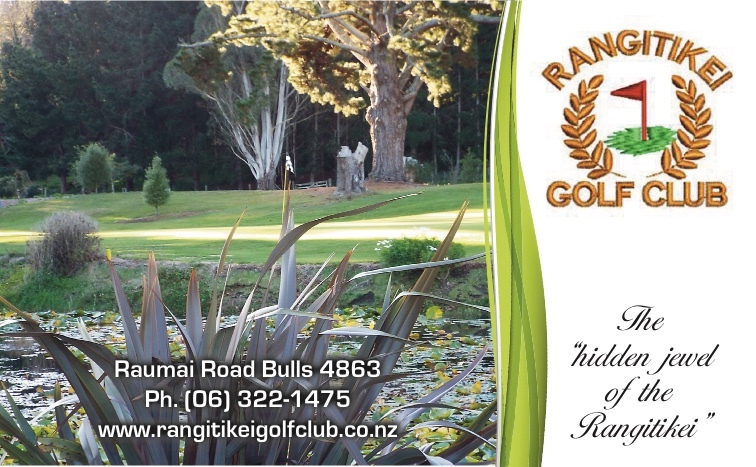 Join us for golf at this unique 18 hole course situated in the heart of the Rangitikei. What gives Rangatira that uniqueness; the course is built on three levels, stunning views of the Rangitikei River, and a ride in the Electric Cable Car, the only one of its kind in New Zealand. There are no bunkers. We are on State Highway One 12km North of Hunterville. Rangatira is arguably one of the best golf courses in the lower North Island as featured on Sky TVs “The Golf Club” November 2009. We were also the winner Golf Rankings ‘Hidden Gem’ award. Get your friends together and come and experience our fantastic course. Have a look at our accommodation options available. Rangitikei Golf Club is known as the Jewel of the Rangitikei. It is located 5kms from the town centre of Bulls. The Rangitikei Golf Club’s par 72 course offers a challenging 18 holes with elevated tees, undulating fairways and greens to test the unwary. Please click on the video link on the website for a virtual tour of the Rangitikei Club course and its facilities. We have golf carts available for hire, the cost is $30.00. Please phone (06) 322-1475 to book carts. Eftpos facilities are only available on Club Days (Wednesday and Saturday). Please ensure you have cash for green fees and cart hire. Visitors are guaranteed a friendly welcome. The Feilding Golf Club is situated on the side of the Oroua River, just 2 minutes from Feilding’s town centre. This 18 hole parklike course features excellent greens, fairways lined with varied plantings of mature trees, is easy walking and well-draining. The Club has been on this current site since 1911. Supported with a Shop and Professional on site, and with catering open for weekly golf commitments as well as functions by arrangement. The Club has been a proud supporter of the Arohanui Hospice over many years, hosts tournaments for Manawatu Wanganui Golf and various NZ tournaments. The Club welcomes golfers from around New Zealand who enjoy what the Feilding Golf course offers. The Waimarino Golf club is an 18 hole course at the base of Mt Ruapehu between Ohakune and Raetihi. The views of the Mountain are spectacular from many of the holes. Come and play any time or after skiing or mountain biking on this gem of a course cared for by our hugely experienced green keeper. There are beautiful trees and manicured holes from tee box to green.. The course drains well both winter and summer. The green fees are reasonable with great deals for country and full membership. The course is managed by a Voluntary Committee who really enjoy hosting individuals and groups. It is a course not to be missed for serious and social golfers.